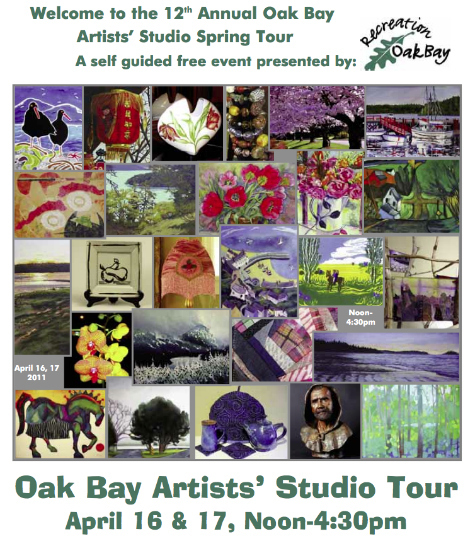 Today and tomorrow Oak Bay welcomes you to the 12th annual Oak Bay Artists' Studio Spring Tour. A self guided free event presented by Recreation Oak Bay. Starting at noon until 4:30pm. Twenty-two homes throughout Oak Bay to enjoy art. Below are the names and locations of the Artists and a map to show their locations for you to enjoy. 1. Victor Lotto - 2605 Cotswold Road located in the Uplands area of Oak Bay (off Uplands Road) 250.592.3585 www.victorlotto.ca He is an award winning artist, who paints in watercolour and acrylic. His work is in collections in Canada and abroad. 2. Pam Stonehouse - 2995 Westdowne Road located in the 'Henderson Area' of Oak Bay 250.298.4218 Photographic images of nature trees, ocean, animals and flowers. Pam is inspired by the surrounding shorelines, Gulf Islands, forest paths and gardens. Cards, prints, canvas (new). 3. Eduard Kajdasz - 2042 Neil Street 250.370.5953 See my new work that reflects both whimsical and abstract themes. 3. Marie Kajdasz - 2042 Neil Street 250.370.5953 Art quilts, story dolls and felted images. Colour, whimsy and humour abound in this award winning artist's studio. 4. Donna Ion - 2682 Topp Avenue located in North Oak Bay (off Pacific Avenue) 250.592.4204 www.gallerdir.com/donnaion Come and see my fresh, contemporary style of acrylic painting applied to our beautiful environment. A work of art is compelling if it elicits memories and emotions of the viewer's own personal landscape. 5. Claire Christinel - 2347 Hamiota Street located in North Oak Bay 250.595.6502 www.gallerydir.com/clairechristinel Welcome to my studio. View my latest directions in painting-small oils and large textural landscapes. Claire is an award winning and FCA artist. Rubbings, Jazz linoprints, reliefs for 'The Elegance of Black,' Watermark Printmakers' April Show including 'Take Five Coast to Coast' illustrations exhibited in Burnaby 2010/11. Print Collection Cards. 7. Sandi Madsen - 2527 Dalhousie Street located in North Oak Bay 250.598.7013 Blues, greens and earth tones complement elements of wonder in beautifully crafted pottery and accessories. 8. Ingrid Fawcett - 2386 Dalhousie Street (North Oak Bay) 250.595.0025 www.in ordinance.com Join Ingrid in her studio where she captures the florals of local gardens and the energy of Victoria's Chinatown in her big, bold, vibrant acrylics. Her canvas bouquets burst forth with colour. 9. Anne Hansen - 2260 Dalhousie Street (North Oak Bay) 250.381.7313 "Many artists are painting whales, bears and eagles but who is painting oystercatchers?" asks Anne, whose bird art frequents the Oak Bay Library. 10. Jean Betts - 2215 Florence Street (North Oak Bay) 250.595.2726 Jean's work reflects time spent weaving in Japan. She creates decorative and functional textiles with an emphasis on detail. Woven, spun and dyed with natural materials. 11. Ron Douglas - 1757 Armstrong Avenue 250.598.8769 www.douglaspottery.com Ron's Creekside Pottery Studio is brimming with new works for Spring. Come and see his beautifully handcrafted functional and decorative pottery for the home and garden. A collection of oil paintings of subjects observed across Canada. Currently focusing on the repetitive elements in landscapes and architechture in bright and colourful compositions. 12. Marshal Hugh Kaiser - 1766 Armstrong Avenue 250.384.1032 www.marshallhughkaiser.com Canadian land and seascapes in oils. Evocative pieces presented in a studio gallery demonstration format. 13. Imke Pearson - 2525 Cranmore Road (North Oak Bay) 250.592.7657 www.bcwomenartists.ca Come and enjoy my new spring watercolours, Newfy rowhouses, unique "Eco-Planet" monotypes and abstract, terraced acrylics. 14. Bonnie-Anne Goodwin - 1871 St. Ann Street located in North Oak Bay 250.592.0832 Bonnie has traveled and lived in different countries where she collected antique and spiritual beads. She is home now creating bracelets and necklaces which will bring harmony into your life. 14. Flo-Elle Watson - 1871 St. Ann Street (North Oak Bay) 250. 592.0832 In the creative hands of Flo-Elle, the centuries old tradition of China painting is given life. A gift to yourself or another, each one is an original, permanent, non-toxic and functional piece of art. 15. Jill Alexander - 2032 Beach Drive 250.884.2405 www.jillalexanderart.com Jill welcomes you to her studio to see her newest collection of West Coast inspired paintings. She works with some unique techniques in soft pastel on archival sanded paper. 16. Joanie McCorry - Showing at 1900 Bowker Place 250.294.1944 www.peridotulips.com Visit Joanie to discover the new magic she has created via her three dimensional paper castings, collages and photos of Oak Bay and beyond. New greeting cards on display. 16. Joan Turner - 1900 Bowker Place located in North Oak Bay 250.592.7757 www.madelainebythesea.com Spring is the season of renewal. Joan is inspired to apaint the beauty of it - bright, joyful acrylics. She welcomes you to come and visit. 17. Pat Martin Bates - Showing at "Eclectic" SUNDAY only 2170 Oak Bay Avenue 250.590.8095 www.electicgallery.ca This one person show features her latest work plus signature pieces. Winner of Queen Elizabeth's Gold and Silver Jubilee Medals, artist Pat Martin Bates, touts international status renowned for original works of visual art perforated and illuminated, suggesting mystic passage. 18. Marion Evamy - 2033 Oak Bay Avenue 250.294.6864 www.marionevamy.com "Freedom and verve!" Join in the apprciation of warm colours and new surroundings of this 'tour favourite artist' at her new space - Red Art Gallery. 19. Maryam Barker - 2226 Windsor Road located in South Oak Bay 250.370.0605 www.lampshade-art.com Stunning selection of hand crafted Lampshade Art created by Maryam. View a wonderful selection of carefully chosen works with various effects and beaded trim. 20. Paul Shepherd - 957 Byng Street located in South Oak Bay 250.592.8419 www.shep-art.com Expressive acrylic landscapes, large and small, drawn from local scenery and rendered in the restrained shades of the coast. Also a selection of paintings inspired by travels in Canada and abroad. 21. Caroline Hunter - 877 Island Road (South Oak Bay) 250.595.8658 An award winning artist, Caroline welcomes you to her home to view her watercolour and acrylic paintings and cards. 22. Karen Prager - 668 Falkland Road located in South Oak Bay 250.592.2282 Terra cotta provides the medium for my pursuit of figurative sculpture. Each piece is an opportunity to embrace the endless variation of form and spirit in the human body. This Oak Bay Map outlines the artists' location via the numbers. I hope this is helpful for you, enjoy your Sunday and look for the Fall 2011 Oak Bay Artists' Tour. I was raised in Oak Bay and have been licensed since 1990 (21 years). Royal LePage Coast Capital Realty, 1933 Oak Bay Avenue, Victoria BC V8R 1C8. My direct number is 250.744.4556 or toll free at 1.800.550.0585 if I can help, be happy to. Victoria Market Update may be helpful if you are curious about Victoria Real Estate. Please stay tuned for more Oak Bay updates.